This website will allow you to find a bus stop near your address. You will click on the State of Ohio or scroll down the page to the section for Ohio and then you can click on Newark City Schools. Once the new page loads you will be able to enter your address, your zip code and select your student's school from the drop down list that your child will be attending. After you have filled in all of the information, click search and the nearest bus stop to your address will appear under the tab marked "my bus stops". If you do not see any information, your child may not qualify for busing, or there may not be any bus stops within the range set by the computer. If you believe that your student qualifies for busing and yet busing is not listed, please call the Transportation Department at 740-670-7155. There is no need to register your high school student for this service, if they are at the stop at the time designated then they will be able to ride the bus. 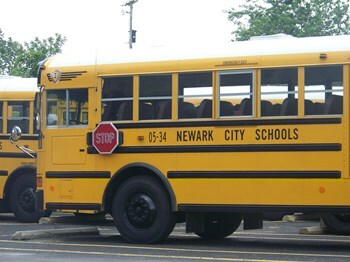 The Newark City Schools bus fleet serves more than 3,900 public and private school students and travels more than 2,400 miles each day. Transportation services are available to elementary students living one mile from school and to middle school living students living 1.5 miles from school. As a cost saving measure, the district does not transport high school students. Q. What determines a bus stop? Our goal is to consistently identify bus stops in neighborhoods on the consideration of safety, efficiency, cost, and shortest over-all ride times. Q. If I am registering or moving in August or September, just before school starts, do I need to call the transportation office? YES! The Transportation Department begins downloading student information from each of the schools during the first week of August. 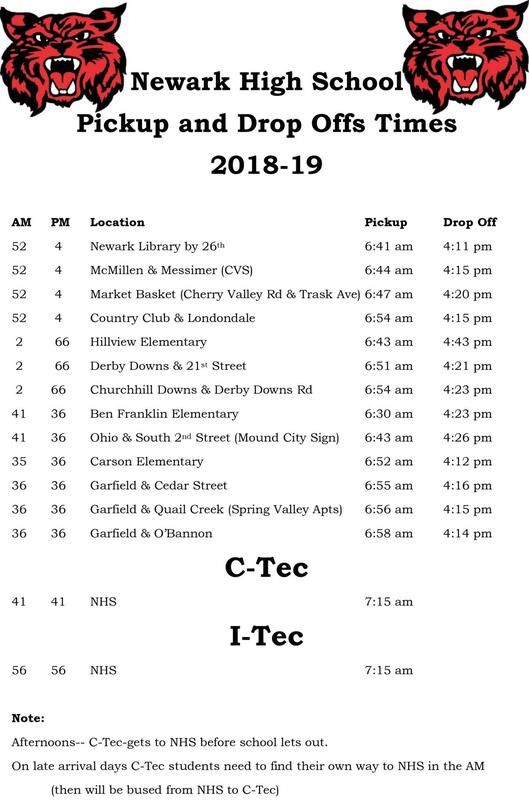 Anyone registering or moving beginning with the first week of August must call the transportation office to make arrangements for transportation services before the new school year. Q. The bus goes right by my house. Why can't it stop here? School bus stops are placed in central locations to shorten route length and times. The transportation department makes every effort to see that these stops are safe and have appropriate walking routes to them. The higher frequency of stops made by the bus increases the dangers for an accident due impatient motorists eager to pass the bus. Q. Who has the authority to change my bus stop or route? The school district's transportation department and its contractors are the only authority that can make changes to bus routes and stops. If you believe your bus stop is unsafe and/or does not fit the bus stop criteria set forth by the district, please contact the transportation department. Q. Why can't I see the bus stop from my house? The school district provides transportation for about 3,900 students to and from school each day. We are not able to position bus stops so that all parents are able to see the stop from their home. It is the responsibility of the parents, guardian, or daycare provider to ensure that their child arrives safely at the bus stop. Q. Why do some children have to cross the street to board the school bus? We are not able to route buses so that all children can board the bus on the door side. Q. Our neighborhood has no sidewalks and has hills and curves. Can we have an additional bus stop so our children do not have to walk to the existing stop? With the large number of streets and bus stops in our school district, it is necessary for some students to walk on roads that have hills, curves and/or no sidewalks. If you have a concern, please contact the transportation department. Q. My child carries a large musical instrument and/or a heavy backpack; he/she is the only student using the bus stop, the stop needs to be closer to our home. Generally, bus stops are centrally located for all students. Bus stops are not changed to accommodate one or more students because that may displace other students further from their home. A central bus stop is necessary because other students may begin riding the bus or new families may move into the neighborhood. It is the responsibility of the parent to ensure that their child arrives safely at the bus stop. Q. I have young children at home and/or I leave home because of work. Q. Can my child ride home with a friend? Occasionally, if a note is provided by the parent/guardian and presented to the building principal and the bus driver. Q. What should I do if the bus doesn't show up? Why is the bus sometimes late? Pick up and drop off times will not vary to any great extent on a normal basis after the first two weeks of school. Circumstances beyond our control could make the bus late occasionally. Vehicle break downs, impassable roads, emergencies, or drivers becoming ill are just a few reasons that could make the bus late. We will always make sure a bus will be at your stop. If the wait is longer than fifteen minutes please contact transportation at (740) 670-7150. Q. What is the maximum length of time for a bus route? We strive to establish route times so that a student will not ride the bus for more than one hour one way. Unfortunately we cannot always guarantee this will happen all the time. Q. My child goes to school in one district/school boundary but my daycare is in another. Can my child ride to and from daycare to school? Transportation across district lines or school borderlines is not permitted. Route timing, distances, and bus capacities make it impossible to accommodate this type of request. The child's parent would be responsible for transportation arrangements. Q. My child goes to a daycare, can they get busing to/from the daycare? No. The school district does not provide transportation to day care centers. Q. What's allowed on a bus? Questions arise from time to time about what students may bring with them on the school bus. The Transportation Department tries to accommodate students' needs whenever possible. The department's rule of thumb is that students may bring items such as musical instruments that they can hold on their laps or between their legs during the bus ride. Objects like toys may be carried on the bus only if they are kept in a student's backpack and are not brought out during the ride to or from school. Any items of dangerous or objectionable nature determined by the Transportation Department. Our goal is for students to have a safe and respectful ride to and from school. We appreciate your cooperation. Q. Why do some buses look empty? Transportation Services makes every effort to fully maximize bus capacities. On occasion, buses may not be fully utilized due to the nature of the transportation. Special Education buses are not fully utilized due to distances, timing and program needs. Q. What happens if my child loses something on the bus? Drivers inspect the interior of the bus after each route. Drivers are instructed to keep all found articles of unknown origin on board the bus at least one day. Articles may be claimed directly from the driver or you may contact the district bus garage. Unclaimed articles are kept in our "lost and found" for a few weeks. Q. Are seat belts required on school buses? Seat belts on school buses are not required equipment. School buses utilize the "compartmentalization" concept to insure student safety. Since the mid-70's the National Highway Traffic Safety Administration has determined that this approach to student safety is the most practical for school buses. Compartmentalization is an arrangement whereby seats are placed close together to absorb the energy of a child's body thrown against it. Additional padding, higher seat backs, frame construction, and anchoring requirements make compartmentalization the accepted choice of and the industry standard. Efforts are currently underway to revisit the seat belt issued on a national scale. Testing is currently being done to determine what the next generation of "child restraints" for school buses might be. The outcome of this testing will be reported by the National Highway Traffic Safety Administration before determining if viable options exist and are necessary for changes. Q. My child is a Special Education student. Who do I contact to arrange transportation? Please call the special education department at 670-7000. Q. Do you need a special license to drive a school bus? Yes, all drivers are required to maintain in good standing a class B commercial drivers license (CDL) with a School Bus and Passenger endorsements. All drivers are subject to drug and alcohol testing. They also need to pass a physical every year. Drivers receive 30-40 hours of initial training and 4 hours annual training during the year. A transportation review committee has been formed.